Liverpool have been undefeated in their last 11 matches in Premier League. 73% of Chelsea’s matches had over 2.5 goals scored in Premier League. Arsenal have been undefeated in their last 9 matches in Premier League. Wolverhampton have scored 45% of their goals after the 75th minute in Premier League. Manchester City have won their last 6 home matches in Premier League. Manchester Utd have scored in each of their last 8 matches in Premier League. Liverpool have won 73% of their matches in Premier League. Fulham have conceded the opening goal in 73% of their matches in Premier League. Chelsea have been undefeated in their last 11 matches in Premier League. Fulham have lost their last 5 matches in Premier League. Chelsea have scored the opening goal in 82% of their matches in Premier League. Chelsea were leading at halftime in 64% of their matches in Premier League. Liverpool were leading at halftime in 73% of their matches in Premier League. Fulham have failed to win in their last 8 matches in Premier League. 73% of Everton’s matches had over 2.5 goals scored in Premier League. Arsenal have scored in each of their last 10 matches in Premier League. Fulham conceded at least 1 goal in each of their last 11 matches in Premier League. 76% of Arsenal’s goals have been scored in the second half in Premier League. 82% of Wolverhampton’s matches had under 2.5 goals in Premier League. 73% of Fulham’s matches had over 2.5 goals scored in Premier League. 67% of Wolverhampton’s conceded goals occured in the first half in Premier League. 91% of Wolverhampton’s goals have been scored in the second half in Premier League. 75% of Manchester City’s conceded goals occured in the first half in Premier League. Manchester City were leading at halftime in 73% of their matches in Premier League. Chelsea have scored 2 goals or more in each of their last 4 matches in Premier League. Manchester City have scored 2 goals or more in each of their last 6 home matches in Premier League. Manchester Utd conceded at least 1 goal in each of their last 7 matches in Premier League. Manchester Utd have scored in each of their last 6 away matches in Premier League. Fulham have lost 73% of their matches. Fulham have lost their last 4 away matches in Premier League. Chelsea have won 73% of their matches in Premier League. Manchester Utd have scored 2 goals or more in each of their last 4 matches in Premier League. AC Milan have scored 2 goals or more in each of their last 5 home matches in Serie A.
Juventus have won their last 5 away matches in Serie A.
Sassuolo have scored 32% of their goals after the 75th minute in Serie A.
Lazio have scored the opening goal in 73% of their matches in Serie A.
Inter Milan have won their last 4 away matches in Serie A. AS Roma have scored 33% of their goals after the 75th minute in Serie A. 64% of Sampdoria’s conceded goals occured in the first half in Serie A. 79% of AC Milan’s conceded goals occured in the second half in Serie A.
Juventus have scored 2 goals or more in each of their last 5 away matches in Serie A. 85% of Atalanta’s conceded goals were conceded away in Serie A.
AC Milan conceded at least 1 goal in each of their last 5 home matches in Serie A.
Juventus have won 91% of their matches in Serie A.
Atalanta have scored 2 goals or more in each of their last 3 matches in Serie A. 31% of Atalanta’s conceded goals occurred after the 75th minute in Serie A.
Inter Milan have won 73% of their matches in Serie A.
AC Milan were leading at halftime in 64% of their matches in Serie A.
Juventus have been undefeated in their last 11 matches in Serie A.
Inter Milan have won their last 7 matches in Serie A.
AC Milan have scored the opening goal in 82% of their matches in Serie A.
Juventus have scored in each of their last 11 matches in Serie A.
Inter Milan have been undefeated in their last 7 matches in Serie A.
Juventus have been undefeated in their last 5 away matches in Serie A.
Inter Milan have scored in each of their last 7 matches in Serie A.
Inter Milan have scored the opening goal in 82% of their matches in Serie A.
Juventus have scored in each of their last 5 away matches in Serie A.
Inter Milan have been undefeated in their last 4 away matches in Serie A.
Juventus have scored the opening goal in 82% of their matches in Serie A.
Inter Milan have scored 43% of their goals after the 75th minute in Serie A. 27% of Sampdoria’s conceded goals occurred in the first 15 minutes in Serie A. 88% of Real Betis’s goals have been scored in the second half in La Liga. FC Barcelona have scored in each of their last 11 matches in La Liga. FC Barcelona conceded at least 1 goal in each of their last 9 matches in La Liga. Alaves have scored 40% of their goals after the 75th minute in La Liga. Huesca have conceded the opening goal in 73% of their matches in La Liga. 73% of FC Barcelona’s matches had over 2.5 goals scored in La Liga. 73% of Alaves’s goals have been scored in the second half in La Liga. Huesca have lost their last 4 away matches in La Liga. FC Barcelona have scored 32% of their goals after the 75th minute in La Liga. 73% of Real Betis’s matches had under 2.5 goals in La Liga. 73% of Espanyol’s matches had under 2.5 goals in La Liga. Espanyol have scored the opening goal in 82% of their matches in La Liga. 79% of Real Madrid’s conceded goals were conceded away in La Liga. 36% of Alaves’s conceded goals occurred after the 75th minute in La Liga. Huesca conceded at least 1 goal in each of their last 11 matches in La Liga. 71% of Real Madrid’s conceded goals occured in the first half in La Liga. 70% of Leverkusen’s matches had over 2.5 goals scored in Bundesliga. 70% of Schalke 04’s matches had under 2.5 goals in Bundesliga. RB Leipzig have been undefeated in their last 9 matches in Bundesliga. 70% of Frankfurt’s matches had over 2.5 goals scored in Bundesliga. Frankfurt were leading at halftime in 60% of their matches in Bundesliga. 88% of Schalke 04’s goals have been scored in the second half in Bundesliga. RB Leipzig did not concede any goal in their last 4 matches in Bundesliga. Leverkusen have conceded 2 goals or more in each of their last 3 matches in Bundesliga. Frankfurt have scored in each of their last 10 matches in Bundesliga. Schalke 04 have scored 38% of their goals after the 75th minute in Bundesliga. Paris SG have scored 2 goals or more in each of their last 12 matches in Ligue 1. 75% of Marseille’s matches had over 2.5 goals scored in Ligue 1. Dijon have failed to win in their last 9 matches in Ligue 1. Monaco have failed to win in their last 11 matches in Ligue 1. Paris SG have won their last 12 matches in Ligue 1. 76% of Marseille’s conceded goals occured in the second half in Ligue 1. 33% of Monaco’s conceded goals occurred after the 75th minute in Ligue 1. Paris SG have scored in each of their last 12 matches in Ligue 1. Paris SG have scored the opening goal in 75% of their matches in Ligue 1. Dijon were losing at halftime in 67% of their matches in Ligue 1. Monaco have failed to win in their last 6 home matches in Ligue 1. Paris SG were leading at halftime in 58% of their matches in Ligue 1. 67% of Dijon’s matches had over 2.5 goals scored in Ligue 1. Paris SG have won their last 5 away matches in Ligue 1. 71% of Dijon’s conceded goals occured in the first half in Ligue 1. Monaco conceded at least 1 goal in each of their last 5 home matches in Ligue 1. Paris SG have scored in each of their last 5 away matches in Ligue 1. Monaco conceded at least 1 goal in each of their last 10 matches in Ligue 1. Paris SG have scored 2 goals or more in each of their last 5 away matches in Ligue 1. Dijon have conceded 2 goals or more in each of their last 3 matches in Ligue 1. Paris SG have scored 34% of their goals after the 75th minute in Ligue 1. 32% of Atletico MG’s conceded goals occurred after the 75th minute in Serie A (Brazil). Palmeiras have scored in each of their last 11 matches in Serie A (Brazil). Grêmio have scored 2 goals or more in each of their last 5 home matches in Serie A (Brazil). Vasco da Gama have scored in each of their last 5 away matches in Serie A (Brazil). Palmeiras have scored in each of their last 5 away matches in Serie A (Brazil). Grêmio have scored 74% of their goals at home in Serie A (Brazil). 72% of Atletico MG’s points have been earned at home in Serie A (Brazil). Palmeiras have been undefeated in their last 17 matches in Serie A (Brazil). Grêmio have scored in each of their last 11 home matches in Serie A (Brazil). Palmeiras have scored the opening goal in 75% of their matches in Serie A (Brazil). Grêmio have conceded 2 goals or more in each of their last 3 home matches in Serie A (Brazil). Vasco da Gama have scored in each of their last 9 matches in Serie A (Brazil). 32% of Palmeiras’s conceded goals occurred after the 75th minute in Serie A (Brazil). 72% of Grêmio’s matches had under 2.5 goals in Serie A (Brazil). 74% of Vasco da Gama’s points have been earned at home in Serie A (Brazil). Palmeiras have been undefeated in their last 8 away matches in Serie A (Brazil). FC Midtjylland have scored 2 goals or more in each of their last 7 home matches in Superligaen. 67% of Vejle BK’s matches had under 2.5 goals in Superligaen. Esbjerg have scored 2 goals or more in each of their last 4 matches in Superligaen. Odense BK have been undefeated in their last 6 matches in Superligaen. FC Midtjylland have been undefeated in their last 13 matches in Superligaen. 80% of FC Midtjylland’s matches had over 2.5 goals scored in Superligaen. FC Midtjylland have scored 2 goals or more in each of their last 5 matches in Superligaen. 67% of Odense BK’s matches had under 2.5 goals in Superligaen. FC Midtjylland have been undefeated in their last 8 home matches in Superligaen. Odense BK have scored 56% of their goals after the 75th minute in Superligaen. 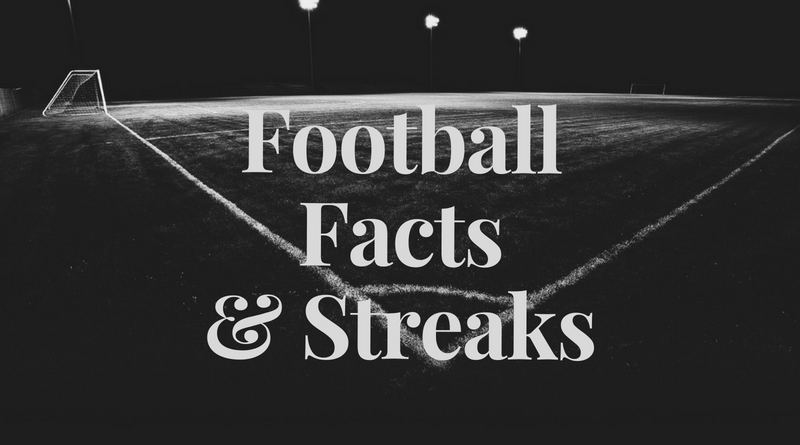 67% of Esbjerg’s matches had under 2.5 goals in Superligaen. FC Midtjylland have won their last 7 home matches in Superligaen. Esbjerg have scored in 86% of their away matches in Superligaen. 69% of FC Midtjylland’s points have been earned at home in Superligaen. 62% of Esbjerg’s conceded goals were conceded at home in Superligaen. FC Midtjylland have scored 31% of their goals after the 75th minute in Superligaen. 100% of Celtic’s conceded goals occured in the second half in Premiership. 40% of Rangers’s conceded goals occurred after the 75th minute in Premiership. 73% of Livingston’s matches had under 2.5 goals in Premiership. Celtic have won their last 5 matches in Premiership. 29% of Livingston’s conceded goals occurred in the first 15 minutes in Premiership. Celtic have won 73% of their matches in Premiership. Rangers were leading at halftime in 64% of their matches in Premiership. Celtic have scored 63% of their goals in the first half in Premiership. Rangers have scored 64% of their goals in the first half in Premiership. Celtic have scored the opening goal in 82% of their matches in Premiership. Celtic have scored 2 goals or more in each of their last 4 matches in Premiership. Rangers have scored the opening goal in 73% of their matches in Premiership. 33% of Celtic’s conceded goals occurred after the 75th minute in Premiership. Rangers have scored 32% of their goals in the first 15 minutes in Premiership. 91% of Bursaspor’s matches had under 2.5 goals in Super Lig. 91% of Kasimpasa’s matches had over 2.5 goals scored in Super Lig. Alanyaspor have lost their last 4 matches in Super Lig. Kasimpasa have scored 46% of their goals after the 75th minute in Super Lig. 64% of Bursaspor’s matches ended up in a draw in Super Lig. Kasimpasa have scored in each of their last 5 away matches in Super Lig. Alanyaspor have failed to score in their last 4 matches in Super Lig. 73% of Alanyaspor’s matches had under 2.5 goals in Super Lig. Alanyaspor have scored 33% of their goals in the first 15 minutes in Super Lig. Bursaspor have scored 67% of their goals in the first half in Super Lig. Kasimpasa have scored in each of their last 11 matches in Super Lig. Alanyaspor have scored 33% of their goals after the 75th minute in Super Lig. 89% of Bursaspor’s conceded goals were conceded away in Super Lig. 75% of Kasimpasa’s goals have been scored in the second half in Super Lig. 38% of Alanyaspor’s conceded goals occurred after the 75th minute in Super Lig. I surely appreciate the effort you put.I give it a big thumbs up.